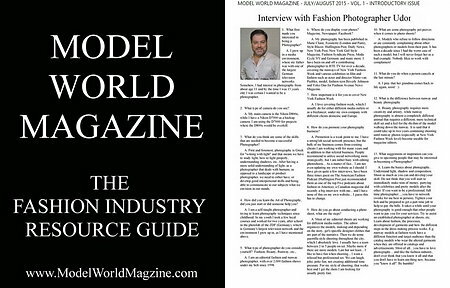 "Interview With Fashion Photographer Udor"
"udor, veteran runway photographer, joins us to talk about New York Fashion Week. Charles hits the trade shows for Market Week and comes back with lots of new Made in USA brand names to talk about. Gretchen Harnick from Parsons talks about the online fashion education community she just launched. Charles and udor talk about what should and should not happen on the runway. Lisa’s Ralph Rucci show review transports us to a poetic realm." The American Fashion Podcast - Episode 36: NYFW Pre-Game Show Extravaganza "Richard Spiegel (The Fashion Tribune) and udor, both veteran runway photographers, talk past, present, and future of New York Fashion Week with Lisa and Charles in the hours before the Fall 2015 collections start rolling down the runways. What’s going on with Fashion Week leaving Lincoln Center? Mens Fashion Week coming in July? How is the Fashion Calendar CFDA transition going? … And lots of great Fashion Week “do you remember that one time when…” conversation." "Reem Acra gives an exclusive interview about her new Stevie Nicks-inspired collection backstage moments before her show. udor joins the crew at Fordham University Law School across the street from Lincoln Center between shows to talk about New York Fashion Week. Lisa continues to track the streetwear wave"
"Paper Magazine editorial director Mr. Mickey is in the studio… along with WWD‘s Media Editor Alexandra Steigrad, Manufacture New York‘s Bob Bland, and fashion and runway photographer Udor. Where are print magazines going? What’s the deal with the circle of freelancers who seem to try to write for every major fashion publication? Do magazines affect designers when they’re creating a collection? Does “no” mean “not that in that form”? What’s the deal with all the intern lawsuits? How do you find opportunities to make your mark in this business? Plus, Mickey’s take on street style, style bloggers, and his favorite insult." New York Fashion Week is next week, so we’ve gathered some great minds to help you get your head in the game. It’s the New York Fashion Week Pre-Game Extravaganza! Guests in this episode include Fashion Unfiltered founder and editor Katharine Zarrella, Decoded Fashion founder Liz Bacelar, ace runway photographer Udor (Instagram), and guest host Cathy Schepis. Fashion Week show formats continue to evolve. A few seasons ago, many in the industry were shocked at the introduction of so many presentations replacing runway shows, and there have been experiments with social media-based shows, 3D effects, and fashion films. What’s now, and what is next? Have bloggers disappeared from the front row? What is the role of individual social media influencers now? Where are we with See Now Buy Now? Is it getting big, or just buzz? Why aren’t there more top customers at the shows? All this and more, in our New York Fashion Week Pre-Game Extravaganza! "I first encountered udor on the risers while testing out the new Sony cameras, the A7R and RX10, over a few consecutive shows. As the room started to settle in anticipation of each show, and the risers were sufficiently full, a large man occupying the front and center position would turn and shout in a booming voice with a heavy German accent the particulars of what we could expect from the show: "there will be acrobatics in the middle" or “at the end of the show, a woman in a wheelchair will come out.” Then, just as suddenly, he would turn back to his monopod and fiddle with the settings on his camera. I could be forgiven for mistaking these strange proclamations as dadaist poetry, but, every time, his assertions would manifest, exactly as he predicted. 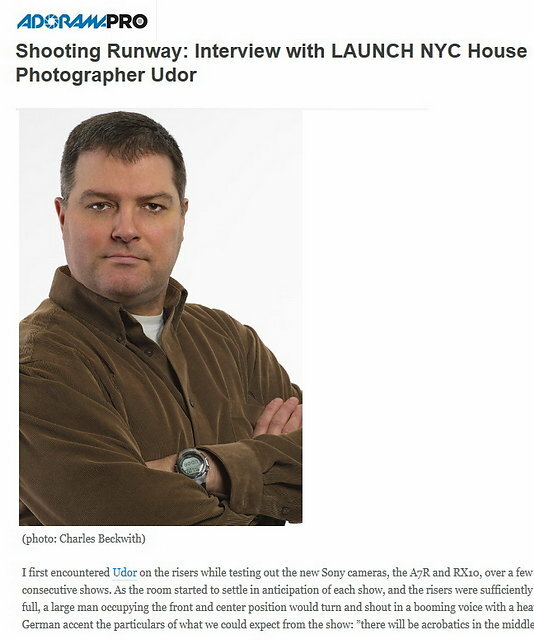 I would soon discover that this was none other than the Launch NYC house photographer, Udor. Not for nothing did Manufacture New York select him... [more]"
"In case you missed last week’s workshop brought to you by AdoramaPro. Here are my notes from the evening’s seminar on how to boost your skills in runway fashion photography with instructors Udor, house photographer for Launch NYC, and Charles Beckwith, executive director of the Fashion Media Center at Manufacture NY. [...more]"